These raw bites contain no butter, no oil, no processed sugar, and no raw egg (or any egg at all). When you’re tempted to spring for traditional raw cookie dough, make this deliciousness instead. 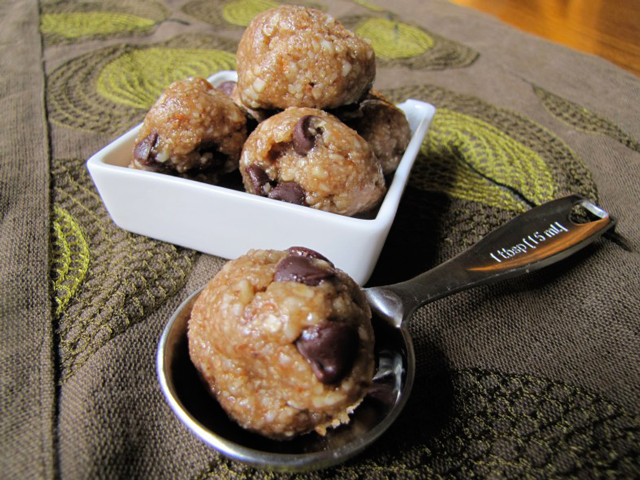 These balls could be the perfect quick midday snack to boost your energy, a dessert alternative, a beach party staple, and more! Grind the almonds, walnuts, oats, cinnamon and salt to a fine meal in a food processor. Stir/grind in the agave nectar or honey as well as the vanilla. Pour the batter into a bowl. Roll the cookie dough into tablespoon-sized balls, placing them on a cookie sheet topped with parchment paper. Firm up the balls by placing the pan in the freezer for about an hour. Store leftover balls in the freezer in a tightly sealed container. For more tips on how to be healthy, visit your local FastMed Urgent Care clinic and speak to a healthcare professional. Source: Voila! With Emily via A Dash of Compassion.